In a collaborative effort to grow the game of soccer in the Southwest region, Forge FC and Southwest Soccer are excited to announce a partnership agreement for the 2019 Canadian Premier League season. The two organizations will work in partnership to develop the growth of the game through the development of the clubs, players, coaches and administrators in the region. As part of the partnership, all members and clubs of Southwest Soccer will be invited to participate in the unprecedented campaign of Soccer Unites Hamilton. Forge FC Co-Founder Bob Young and the Club have given the Inaugural Match of the Canadian Premier League back to the community and all members of Southwest Soccer can enter through the contest to win tickets through https://forgefc.canpl.ca/socceruniteshamilton. Forge FC season seats are on sale now. Fans can become a Co-Founder and take advantage of the exclusive, one-time opportunity to be a season seat member in the inaugural year of a professional soccer club. Starting at $17 per match for Co-Founders and including the Forge FC home jersey as a part of your membership package, Forge FC soccer is the perfect mix of family-friendly affordability and excitement with friends. Click here for a complete list of Co-Founder season seat membership benefits. 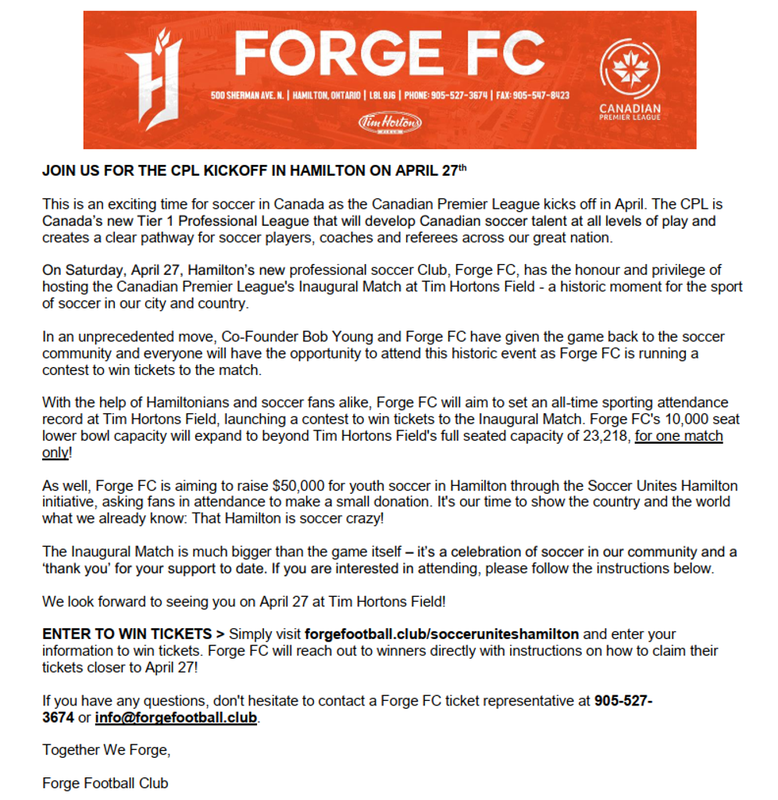 Join Forge FC for the CPL Kick-Off!! !